Why Not Just Change It? What Is The Danger If I Plug It? If you are thinking about going cross-country on your brand new bike, you should first figure out how to use a GPS on a motorcycle. Also, just to be on the safe side, you can find more info here about tire changers should you ever have problems that need patching up. 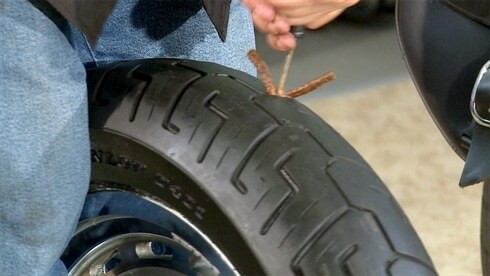 Speaking of patching up, is it safe to patch a motorcycle tire and just move on? Let’s think about that. A big part of the rider community seems divided when it comes to this issue. 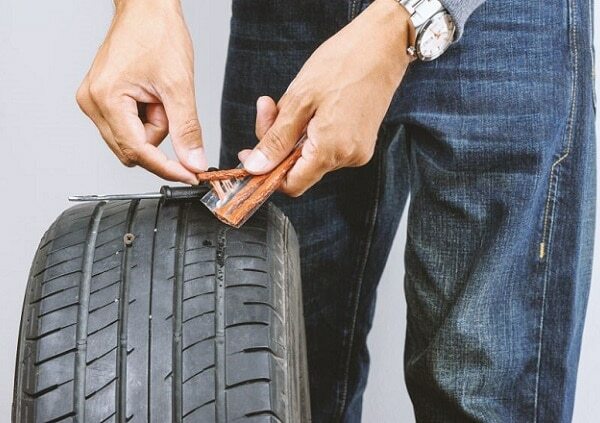 While many of them refuse to patch a tire claiming it is way too dangerous and, at high speed, can potentially result in an injury, another part is holding on to the belief that sometimes you just have to patch since you can’t always carry a spare tire, and when driving with a reasonable speed it’s fairly safe. Another reason why patching the tire is sometimes attractive is because it is so very hard to completely change an old tire and install a new one. You have to remove the valve core completely, break the bead of the old tire from the edge of the rim then slide the bend in the iron down to force it down. And that’s just the beginning! When you are out on the trails patching is the quicker, more adaptable way of at least getting you home safe and with the possibility of getting the bike to a shop. Also, there have been far fewer reports of the dreaded bloody knuckles when patching a tire as opposed to when changing one. The camp that plugs their tires all the time and faced no problems will, of course, continue to do so. On the other hand, the motorcycle purists continue to say that this is the most dangerous thing you could do for your bike or yourself. Our research has led us to the conclusion that when done in the right circumstances, patching is a reasonably safe alternative. If you do it right, you should be okay until you can get your bike a more thorough repair and change it altogether. Keep in mind that this should only be seen as a temporary solution, as the tire will eventually need to be changed. The dispute is not so strong when it comes to the faster road bikes since a lot of people in that community will often be going off-road and keeping a bunch of extra tubes around is not always possible. Where it gets really intense, however, is when people are talking about patching the tire on a street bike. The problem here is a lot of potential danger can result directly from how well the tire was plugged. If this operation is done by a beginner, it will automatically result in more danger for him than it would for an experienced rider who’s worked on dozens of tires. It’s hard to tell how much damage the tire suffered if you don’t plug it from the inside, allowing you to inspect both sides. Even if it is installed properly, the plug could still fail and lead to a dangerous situation for the rider. Our recommendation is that if you have never done this before, don’t start when you are off-road with no houses for miles. Keep it on the safe side! Never, ever plug a sidewall hole! The reason for this is because there isn’t enough support for the plug to do its job the way it is supposed to be and, at the same time, the sidewall flexes too much and can sever the plug. The only time it is safe to do this operation is when the hole is completely in the tread area of the tire. When you do get your bike home, your first thought would be to take it to a repair shop or dealership so that you can get that hole patched and the motorcycle up and running again. If this was your plan, we are sorry to inform you that you will need to re-think it. Most repair shops will not patch a tire under any circumstances, no matter what you say to them. The main reason for this, though, is not mechanic but rather legal. Shops will refuse to patch your tire for liability reasons, because if they plug it and it fails, you are likely to be injured in the resulting crash and they are very likely to get sued for the damages. The consensus way of being protected from this is patching no tire, ever. In the United States, especially, it will be very very hard to find a dealership or shop that would agree to this. If you are a beginner rider with a tire problem, we recommend taking the bike to them and allowing them to completely change the tire rather than trying to patch it by yourself and get involved in a dangerous situation. Other people would advise that if you absolutely must patch, it is safer to plug the rear tire and not the front one. The reason for this is because it will be easier to bring the motorcycle from speed to a stop with a rear flat as opposed to a front flat. Doing it with a front one is much likely to get you thrown off and possibly injured. The community really is divided on this one as it seems certain things work for certain people so it is very hard to form a solid opinion. For example, some riders say plug the tire then replace it as soon as possible, while others advocate for plugging the rear and riding it to the chords. Superbikes, for instance, typically use tubeless tires that come with a steel belt ply underneath the tread. These types of tires should be able to be plugged in for just long enough to get you to a tire fitment shop. The reason it is considered dangerous and you should ride slowly is that the steel belt ply under the tread will fray near the hole and, over time, cause additional damage to the tire that can result in instant failure, potentially very dangerous for you. Dirt bikes are less of an issue, like we said, because they usually come with a pliable canvas belt under the tread, as opposed to the strong, metal one. Plugging a hole in this one will make it stay sealed for a very long time, depending on the size of it. If done correctly, it can even be considered a permanent solution. So, all things considered, patching a tire comes down to the type of tear, the type of your bike and the time in which you can get it to a professional shop. If you have read this article and feel safe doing it, go ahead and we wish you nothing but happy rides ahead!